Jace broke Ava's heart when he left her for his music career. He's now a superstar, so the decision paid off financially. Emotionally, however, Jace doesn't think he did the right thing. Ava is still the woman he loves. When his father dies Jace travels back to his hometown for the first time after many years, hoping he'll see her again. Will Ava be willing to give him a second chance? Ava has never felt complete again after Jace left her to become a famous country singer. When she hears he's back in town she doesn't know if she's ready to see him. The old wounds have never completely healed and she hasn't forgiven him for leaving her behind. Jace hopes Ava will be willing to forgive him. What's stronger, the pain of the past or the love in their hearts? Hold Her Again is a great romantic story. Ava and Jace were high school sweethearts. They knew that what they had was the real deal, but Jace wanted to prove himself and chose his career over Ava. My heart ached when I read about the impact of his decision on both of them. It's clear from the start that there's much love between them and I couldn't wait to find out if that would be enough to bring them back together or if their old wounds would forever keep them apart. Shannon Stacey's writing has a nice easy flow. 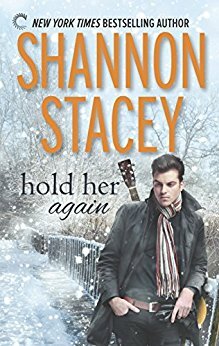 Hold Her Again is a sweet novella about music, following your heart and dreams for the future. Jace is a celebrity with plenty of money and status, but he's also just a regular guy, trying to win back the girl he still loves. I liked that combination a lot. Hold Her Again starts with sadness, then brings hope and ends with a smile. It's a lovely feelgood story. If you love romantic stories about second chances Hold Her Again would be an excellent choice. It is an intriguing premise! @s_w_j_m(twitter) I personally don't think the trope is up my alley but seeing how much you've enjoyed it, I'm going to pick it up. I do hope there'd be some angst! Interesting. Thank you for the review. I love second chance romances. If I was Ava I'd be plotting ways and means of getting revenge. That's probably why I'm still single! It sounds like it would be a tear jerker. I love romance stories, this one sounds amazing.